We don't want to do too much before FFG is done running events (ie GenCon). Things are in the works. Anyone has some champion promos to spare? Also, I think "Replacement" is the Will of the Force for us - we can tweak useless objective pods for be playable. Yeah, if we go forward with new content Galak should be in charge of the template. Speaking of the council. Any updates pre Gencon? Or are we all going to have to wait until after? Galak, I love your work on the FFG boards, too! I'd love to see more stuff from you. All right, it's after Gencon! Let's get some updates! Will be any option to get these custom made pieces of awesomeness into europe? And the ones that already exist as well? Hey! So now that we are post-FFG, I want to bring up a few discussions I want to have about the game. If these deserve their own threads, let me know. 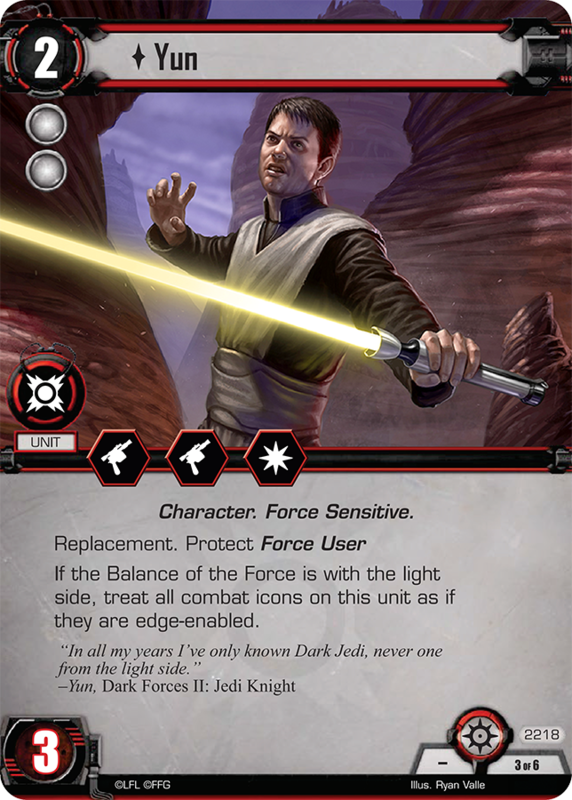 -Forced reactions and cancels - After a discussion with Brad at Gencon, I have been swayed to the side that forced reactions should not be cancelable by things like Distraction and Pilot Vader. A longer discussion is happening on the UK forums over this. It may be worthwile to bring it here. I will also say it may be a giant troll-fest and a tough conversation to have on a large scale. Fan the flames. -Replacement keyword / cards - I think these are awesome for player designed content, but currently horribly balanced. I think a real discussion needs to happen about where and when these cards should be allowed in other pods. My first thought is that you must replace a card of identical affiliation to the replacement card, but this definitely deserves a deeper look. -Continued tournaments, community, prize support - I want there to be more tournaments, and I am sure NYC can still host a yearly "Empire Day" tournament and give out great swag. I hope this doesnt become a regional thing. Also, we could take a hint from Kiramode concerning online touraments. Needs more discussion. -Council has plans for the champion cards, stay tuned. Going forward, it's relatively unlikely we will use Replacement as is to create new cards, but we might consider an altered version where there's a specific card in a specific set a card replaces. -Also stay tuned for OP announcement from the Council. I'm not personally involved in the OP sub-committee, so I'll leave it to them. I'm not sure we're entirely post-FFG yet even though there aren't any other official U.S. tournaments. Aren't there still a few other national tournaments scheduled to take place in Europe in the next month or so? I've seen posts about a UK nationals and French Nationals that have yet to take place and they appear to be official FFG sponsored events. I think SWLCG is getting a side event at UK Nationals, but not a championship? No idea about French Nationals. Guess I didn't read the UK announcement closely enough. I thought since it was posted on that UK LCG FB page it was nationals for the LCG as well as other games, but I see what you referring to now. Since it's a side event, does that mean it's not official? Now the UK nationals are done, can we get an update on the status of this project? Or is all hope loss? Don't worry. I'm pretty sure there is still hope. Éric Da Silva is, at last, after 2 second places, the 2018 French Champion. He won against Adeptus, the European Champion in the final of a 25 people tourney, with 5 Swiss round and a double elimination top 8. Now it’s Time for the community to take over!